dog kennels in pine, cedar or LP Smartside plywood siding. 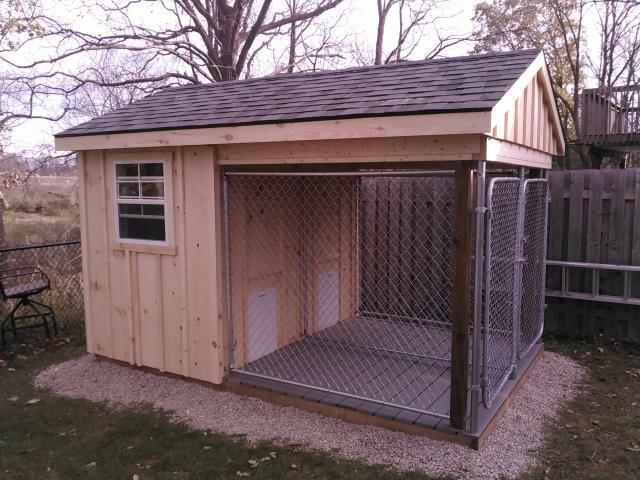 Dog kennels made by Hishon Woodworking are custom made and can be designed to suit your personal needs. They can be constructed for 1 dog or many dogs. This particular 8’x 12′ design shown is made for 2 dogs with 2 separate sides. It’s constructed with pine siding, composite decking, galvanized fencing and asphalt shingles. Even though we could pour a concrete base, the interior floor of the shed is plywood which is a little warmer for the dogs than a concrete floor. All that is needed for under the kennel is clear gravel. This allows the pressure treated and plywood floor to remain level and dry.